MOSCOW -- Russia, holder of the world's fifth largest stash of foreign currencies, is increasing its gold purchases. One reason for this is the country's increasing wariness of the dollar and euro now that Russia has come under U.S. and European sanctions over the Ukraine crisis. Another reason is that these currencies are becoming increasingly risky to hold due to the swelling debts of the governments that back them. According to data compiled by the International Monetary Fund, Russia increased its gold holdings for the fifth straight month in August, overtaking China and Switzerland to become the world's fifth-biggest buyer of the metal. Russia had 1,112.5 tons of gold in its foreign reserves at the end of August, up roughly 77 tons, or 7%, since January. The ratio of gold to foreign reserves has risen from 8.3% to 9.8%. Worsening relations with the U.S. and European countries have contributed to the rise in Russia's gold holdings. The U.S. and European Union imposed economic sanctions against Russia after Moscow in March annexed Ukraine's Crimean Peninsula. The sanctions have made it difficult for Russia's arms industry to make settlements in U.S. dollars. And dollar-based energy exports, the backbone of Russia's economy, could also be affected, depending on any future sanctions. Dollars and euros are said to make up more than 70% of Russia's foreign currency reserves. A senior official at Russia's Ministry of Energy, however, said President Vladimir Putin's administration has reviewed the country's foreign currency reserves from the view that Russia needs to break away from its dollar and euro dependence to counter the sanctions. It seems that Russia has been lowering the ratio of its dollar and U.S. treasury bond holdings while increasing its purchases of gold and the Chinese yuan. Gold's sluggish price has also wooed Russia. Gold has been under selling pressure amid growing speculation that the Federal Reserve may soon raise U.S. interest rates. The market's mindset in September pushed gold prices to year-to-date lows, making it easier for Russia to increase its holdings of the metal. Holding gold also helps Russia avoid contamination risk, should the West's increasingly precarious financial house of cards collapse. Attending the St. Petersburg International Economic Forum in May, Putin stressed to reporters that it is important to deposit gold and currency reserves in a rational and secure way. Many market observers expect Russia to increase its gold holdings over the next few years, as the ratio of gold in its foreign reserves is still smaller than those of France and Germany, whose gold holdings are around 60% of total foreign reserves. An executive at a financial institution in Moscow predicts that the Central Bank of the Russian Federation will purchase another 200 tons of gold toward the end of the year. China, which has been critical of the sanctions against Russia and has strengthened economic ties with the country, has also been increasing its gold holdings in recent years. 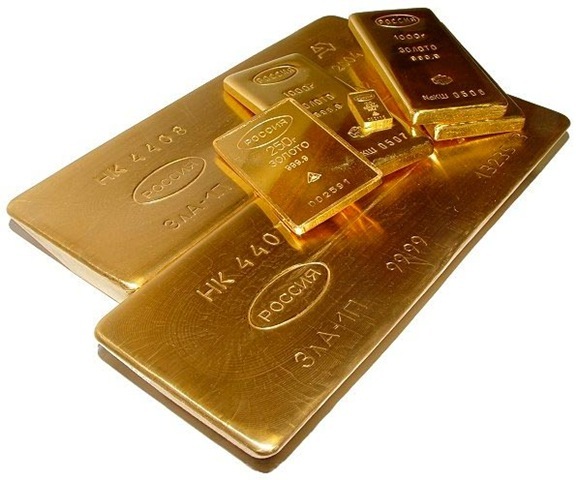 Some market watchers predict that if China and Russia, which have adopted a confrontational approach to Western countries, further increase their gold holdings, the dollar's status as a key currency could be shaken.